The Dance Dance Revolution series started in 1998 and has grown to a large set of games in the franchise. This list of Dance Dance Revolution games documents games released, including systems, formats, and regions for which the games were released. These lists are sorted by platform of release, then region, then best-known release date, then regional or renamed version title, if any. Releases that have sold more than one million copies or have been re-issued as Greatest Hits are colored orange. 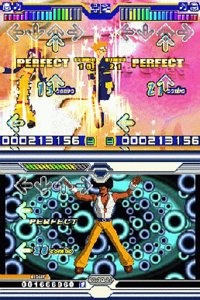 The gameplay screen of the preview version of Dance Dance Revolution Ultramix (top) and the gameplay screen of the released version (bottom). Released as Dance Dance Revolution Ultramix. This game was never released. Reason: PlayStation 2 and arcade board blacklist issues. The European arcade release of Dance Dance Revolution SuperNova 2, titled Dancing Stage SuperNova 2, was never shipped due to importation issues surrounding the PlayStation 2-based engine. The arcade release of DDR SuperNova 2 uses an imported Japanese PlayStation 2 to power the game. The import ban came after the release of Dancing Stage SuperNova, the second Dance Dance Revolution arcade released in Europe to use a PlayStation 2 engine. A Dancing Stage SuperNova 2 was released for the European PlayStation 2 directly, but is based on the North American PlayStation 2 release of Dance Dance Revolution SuperNova 2 instead of the arcade. Only a test build existed in North America; this game never saw a full release outside of Asia. Dance Dance Revolution Solo Bass Mix had a public test build in early 2000 in the United States at Konami's former test location Diversions in Chicago, IL. It was later replaced with Dance Dance Revolution USA. Major differences from the Japanese build is the absence of 3 songs: "That's The Way '98," "Together and Forever", and "Get Off." The Nonstop Megamix course including these songs were also not present. All other functions and hidden modes were available for play including Maniac mode, Ultimate Maniac mode, Nonstop Megamix, and machine link play. Dancing Stage Solo is a cancelled video game for Europe. Konami filed to trademark the name on July 9, 1999. It was registered on July 25, 2000, but expired ten years after filing. This game's Caution screen, high score background and title screen were present as unused game data in the Asian versions of Dance Dance Revolution Solo 2000. Released as Dance Dance Revolution Extreme. However, many images on the Internet represent a long-standing hoax. Dance Dance Revolution (2014) had a location test in USA. Only a test build exists, this game never saw a full release in North America. The test build was available to the public on mid 2015 in select Round 1 and Dave & Buster's shops in the USA. e-Amusement functionality was available. The game was later replaced with Dance Dance Revolution A in the USA and Canada, making it the first Dance Dance Revolution release in USA since Dance Dance Revolution X2 and the first in Canada since Dance Dance Revolution X. Most of these games run on the StepMania software, however a few of them are hacks of existing Dance Dance Revolution games. ^ As of 2017, two Canadian arcades imported Dance Dance Revolution X2 from the United States. One is an upgraded Dance Dance Revolution X cabinet, while another is a dedicated X2 cabinet. ^ Dance Dance Revolution 2ndMix was updated after its initial release with a few new songs and the ability to connect to and play alongside Konami's DJ simulator games, Beatmania IIDX. While the official name of that version of DDR when alone was Dance Dance Revolution 2ndMix Link Version, when connected to the two Beatmania IIDX cabinets it was compatible with it was referred to by two other unique names. ^ Along with the "International Versions" of Japan's DDR series, Korea specific versions of Dance Dance Revolution 3rdMix were released with a partly exclusive song list. Some of the Korean songs were later featured in the Japanese and international Dance Dance Revolution 4thMix, as well as the Plus and Solo versions. They have not been used in the DDR series since. ^ Due to a licensing mishap during the launch of Dance Dance Revolution Ultramix, the game was temporarily unavailable to Canadian players, forcing them to wait for Konami to secure the rights to certain songs and rerelease the game for all of North America. ^ The "second release" versions of Dance Dance Revolution SuperNova and Dancing Stage SuperNova in North America and Europe were a game disc replacement to fix audio syncing issues with the initial release of the game. Along with bug fixes, the discs added new songs to both versions. ^ As of 2017, two Canadian arcades imported Dance Dance Revolution X2 and one imported Dance Dance Revolution A from the United States. ^ "Product information for Dancing Stage Disney MIX (Australian release)". Shopping.com UK. Retrieved 2008-01-08. ^ a b Konami. Dance Dance Revolution SuperNova (United States release). Arcade. ^ Konami. Dance Dance Revolution SuperNova 2 (American release). Arcade. ^ Baka of the Orochi. "DDR Supernova 2 US Arcade version released!". bemanistyle. Archived from the original on 2008-03-20. Retrieved 2008-01-18. ^ xbskid. "DDR Disney Dancing Museum translation guide". DDRUK. Archived from the original on October 21, 2004. Retrieved 2007-12-19. ^ a b c d "Dance Dance Revolution Hottest Party". GameFAQs. Archived from the original on 2008-03-30. Retrieved 2008-03-30. ^ "Dance Dance Revolution Hottest Party with Dance Pad". Konami. Archived from the original on 2008-03-30. Retrieved 2008-03-30. ^ "Bemani Pocket Dance Dance Revolution -Finger Step-". List of beat mania pocket series (in Japanese). Retrieved 2007-12-19. ^ "Bemani Pocket Dance Dance Revolution -Hello Kitty version-". List of beat mania pocket series (in Japanese). Retrieved 2007-12-19. ^ "Bemani Pocket Dance Dance Revolution -Dear Daniel version-". List of beat mania pocket series (in Japanese). Retrieved 2007-12-19. ^ "Bemani Pocket Dance Dance Revolution -Winnie the Pooh version-". List of beat mania pocket series (in Japanese). Retrieved 2007-12-19. ^ "Dance Dance Revolution Universe 3 ??????" (in Chinese). Play-Asia. Retrieved 2009-05-16. ^ Leeper, Justin (April 2007). "Dance Dance Revolution Universe". Newtype USA. 6 (4). p. 128. ISSN 1541-4817. ^ "Dance Dance Revolution: Disney Grooves". IGN. Retrieved 2009-05-16. ^ "DanceDanceRevolution Hottest Party 3 - Konami lässt die Hüften kreisen!" [Konami can circle the hips!] (in German). Konami Digital Entertainment GmbH. 2010-02-18. Archived from the original on 2010-02-22. Retrieved 2010-02-23. ^ "Dance Dance Revolution 3D - Mobile Game". GameZone. Archived from the original on 2011-07-11. Retrieved 2007-12-19. ^ "Dance Dance Revolution - Mobile Game". GameZone. Archived from the original on 2011-07-11. Retrieved 2007-12-19. ^ "Dancing Stage MegaMiX game overview". Atari Australia. Archived from the original on 2008-08-04. Retrieved 2008-01-08. ^ "Dancing Stage Fever game overview". Atari Australia. Archived from the original on 2008-08-04. Retrieved 2008-01-08. ^ a b "Dancing Stage: Hottest Party". Nintendo Australia. Nintendo. Archived from the original on 2008-05-21. Retrieved 2008-03-30. ^ ESRB website with the search term "Dance Dance Revolution Ultramix". ^ "Dance Dance Revolution Ultramix Screenshots and Images from GameSpot". GameFAQs. Retrieved 14 September 2009. ^ "Dance Dance Revolution Ultramix". Microsoft. Archived from the original on 1 June 2009. Retrieved 14 September 2009. ^ a b "Bemani PlayStation 2 Hardware". System 16. Retrieved 14 September 2009. ^ "DANCING STAGE SOLO (European Union Trademark No. 001236710) - TMDB". tmdb.eu. Retrieved June 19, 2017. ^ "Dance Dance Revolution Solo 2000 (Arcade) - The Cutting Room Floor". tcrf.net. Retrieved June 19, 2017. ^ "Dance Dance Revolution Link Version". Dance Dance Revolution 2ndMIX (in Japanese). Retrieved 2007-12-19. ^ "This is the Club Version!" (in Japanese). Retrieved 2007-12-19. ^ Ross (Islander). "How to tell one third mix from another". DDR Freak. Retrieved 2007-12-19. ^ "Buy Dance Dance Revolution Ultramix (Xbox)". Play-Asia. Retrieved 2008-01-08. ^ Junior Asparagus. "Konami Addresses Sync Issue in DDR SuperNOVA". DDR Freak. Retrieved 2007-12-19. This page was last edited on 15 April 2019, at 20:54 (UTC).